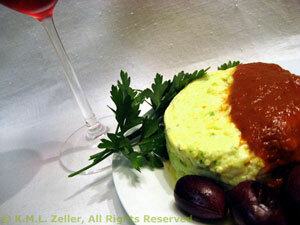 Zucchini Timbale, Red Pepper Sauce, gourmet Thyme for Cooking starter. This makes a lovely presentation for a first course and is simple to make. The sauce is made from purchased whole pimientos. You can substitute sliced pimentos or 'roasted red peppers', which, I think, are the same thing; just a marketing difference! I use a metal bread pan to bake them in with very hot tap water to start. Prepare timbale dishes (ramekins or small custard baking dishes): Butter the bottom, then line with buttered parchment (wax) paper. Make two additional circles of buttered paper for the tops. Shred zucchini using medium holes on the trusty box grater. Whisk together egg and mustard. Add zucchini, herbs, cheese and mix well. Cover top with remaining circles of buttered parchment paper. Set into a pan of very hot water that comes half way up the sides of the dishes. Put into a pre-heated 400F (200C) oven and bake 25 - 30 minutes, until set. Remove top paper and slide a knife around the sides to loosen. Invert on to the serving plate and remove bottom paper. Put all of the ingredients into a blender and purée until smooth. Refrigerate half of the sauce for another use. Pour the other half into a small saucepan and heat to a simmer. Keep warm until needed. Spoon some Pimiento Sauce on top and around the timbales and serve.